KATHMANDU, June 13: Small farmers have expressed their disappointment toward the budget for Fiscal Year 2018/19. Speaking at an interaction in Kathmandu on Tuesday, small farmers also raised question over the policy and programs for the agriculture sector. Though the government has set a target of achieving double digit growth in farm productivity, the said the government seemed to be focused on secondary things only, and not focusing on increasing production of staple food crop. Presenting overview of farmers toward the budget, Somat Ghimire of National Farmers Group Federation (NFGF) said that the country was struggling to increase production of paddy, oil, meat and other basic edible products. “However, the budget has prioritized production of lime, betel nut, olive and other secondary agro produces,” Ghimire said in his presentation. “The budget has also failed to address the issue of farmers' pension and classification clearly.” He also requested the government create environment conducive for small farmers to earn their livelihood through farming. Ghimire also said that the budget still seems to be prioritizing the central government rather the local units. Similarly, Uddhab Adhikari, chairperson of NFGF, said that the budget was not in favor of agricultural development. 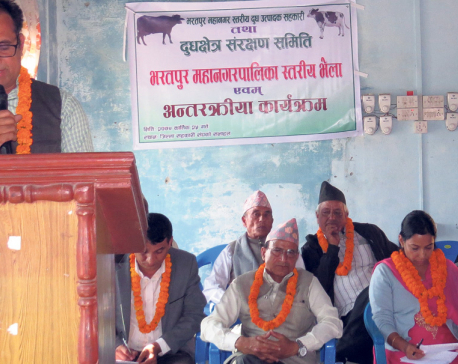 “The current budget cannot bring programs for development of small farmers,” Adhikari added. Responding to questions raised by farmers, Minister for Agricultural, Land and Cooperatives, Chakra Pani Khanal, said that the 58-point action plan published by the ministry is not a complete document. “I agree with most of the things that you have raised regarding the budget. But our commitment is to develop agricultural sector,” he said, urging all stakeholders to make efforts for achieving the target of achieving double-digit agri growth. Khanal also said that the ministry will address demands of farmers gradually. He further expressed commitment to stop defragmentation of farm land for unproductive purpose. The minister also said that the ministry will implement integrated market management in all seven provinces form the upcoming fiscal year. Dilli Ram Sharma, director general of Department of Agriculture, said that the target of doubling agro production in the next five years was gettable. “Though the budget for the FY 2018/19 failed to address all the issues of farmers, I would like to ensure you that doubling agro production in five years is possible,” Sharma added. Farmer leaders from several districts, and representatives of the ministry and different departments under the ministry participated in the interaction that was organized jointly by NFGF and Nepal Agriculture Journalists Academy (JONAA).